EVERYONE is more or less familiar with those amusing pictures that appear from time to time in the pages of our comic journals, which are supposed to caricature the life and customs of prehistoric times. In the drawings of genial humorists we behold skin-clad individuals making agonised efforts to get out of the path of scaly monsters, or pressing home the point of a bad joke with the aid of a stone axe. These pictures, one feels, have done much more to form the popular idea of what " prehistoric " times were like than all the efforts of learned professors. But, unfortunately, they have given a wrong impression of the Stone Age, and have led many people to believe that it consisted of a single period in which man shared the earth with enormous beasts, which were, in reality, extinct for many ages before he made his appearance in his present form. No wonder that most of us have but a vague idea of the vast period we call the " prehistoric," for the dreadful truth is that the learned people who have devoted their days and nights to the study of this enthralling subject know very little more about it than anyone else. They realise, however, that it lasted for countless centuries of time, and was so full of changes, and of the rise and disappearance of different types of people and habits of life, that they have not yet concluded just how many phases or periods it really had. So when we ask ourselves, "What sort of life did boys lead in prehistoric times?" we are at once faced with the question, what part of this enormous stretch of time that lasted for countless thousands of years is meant? It is usually divided roughly into the Paleolithic or Old Stone Age, and the Neolithic or New Stone Age. During the more ancient of these periods there were centuries when Europe was in the grip of perpetual ice; there were other periods, quite as long, when sub-Arctic conditions prevailed; and still others when the country we know as Britain was still joined to the Continent by land, and the ancient Londoner stewed in a tropical sun and wore a necklace of tigers' claws as a sort of life-insurance against wild beasts. Just think of the centuries and centuries  not years  stretching away in the distance of time like trees in a long avenue, and it will give you some faint impression of how difficult it is to speak of these vast ages as a whole. And through all these countless phases of time, with their thousand changes, lived the human boy  just as much boy in the Ice Age or that of the sabre-toothed tiger as he is in the Aeroplane Age, and much more of a natural scout. One thing about him is clear: his life in these periods of the misty past was not so different from that of his elders as it is now. It was only when food became plentiful and man had leisure to turn his thoughts to the necessity of educating his children that the life of the boy began to differ much from that of the man. In prehistoric times, once he had left the days of actual infancy behind, the boy became almost at once a little man, thinking for himself, fending for himself, just as do many street arabs at the present day. The constant struggle for existence, the everlasting search for food, did not give much scope for sport as the modern boy knows it. But of sport of another kind there was plenty and to spare  a kind in which failure often meant a sudden and dreadful death. Sport is of two kinds  that by which you merely amuse yourself or pit your strength or skill against an adversary, and that by which you try to obtain food and clothing. 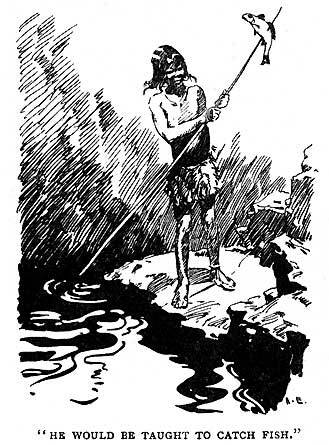 It was probably the latter variety of sport in which the prehistoric boy excelled, in the Old Stone Age especially, when practically the entire energies of man were bent to the exciting and often bitterly disappointing quest for food. And out of this constant search for the sustenance that was to keep him alive, all kinds of quaint and curious customs grew, until the life of the prehistoric boy was almost surrounded by them. He was a slave to rules. If he killed an animal for food, that animal was certain to be the property of some mysterious being  some god, as we would say, who, if our hunter did not give him part of the blood or flesh of the animal killed, would certainly punish him. He must wear certain amulets or charms to keep evil influences away; he must not pry into sacred places, especially into the cave or hut where the grown men of the tribe held their meetings and practised a sort of primitive Freemasonry; he must keep away from the hunting-grounds of others. His boyhood was brief, for he was probably a full-fledged warrior at an age when most boys of to-day are still at school. During the Old Stone Age he would be taken from the care of the women at six or seven, and taught to assist in the lesser duties of food-getting. He would be taught to weave nets of the sinews of animals, to set traps for smaller game, and, above all, to catch fish. Indeed, in the latter occupation a great deal of his time would almost certainly be spent, for fishing would be regarded as an easy manner of obtaining food at which a boy would not be likely to come to much harm. Picking and storing nuts, too, which figured so largely in the diet of early man, would as certainly be one of his occupations if it did not take him too far away from the ancestral cave or earth-house. 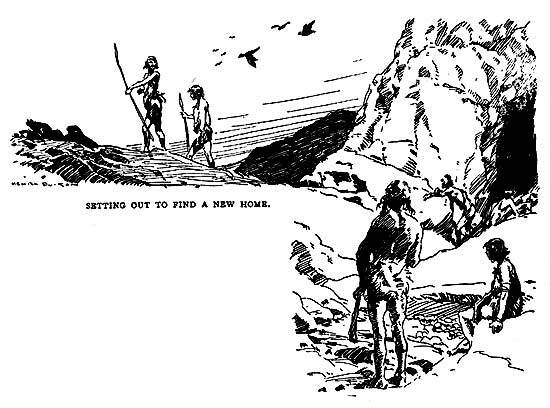 The prehistoric scout would certainly be a good deal of a traveller. Not that he would move very quickly from place to place, for the hunter must follow his game, and that is a slow process. In the temperate periods he would follow the herds of aurochs or buffalo over the grasslands of Europe, much in the same manner as did the Red Indian over those of America, being dependent upon the animal for almost everything  food, clothing, sinew, and bone. Indeed, one of our most brilliant writers upon prehistoric life believes that the Red Man of America is nothing more than the man of the Old Stone Age, who was hustled out of Europe into Siberia, and latterly into America, by the men of the New Stone Age. The boy of this far-off time, in its more temperate periods, would probably be a tent-dweller on wide spaces. But if he existed during the Ice Age in any of its recurring periods, his would be a life very much like that of the Eskimo. Indeed, we know quite certainly that in what is called the Magdalenian period (so called after the rock-shelter of La Madeleine in France, where many of its peculiar weapons and tools have been found) Europe was covered with ice, snow, and glaciers; its inhabitants lived on seal, bear, and walrus, and made weapons and implements from their bones. On one of these implements is the carving of a fur glove, and from this and other evidences we know that the people of that time wore skin clothes like the Eskimo. When about twelve years old the boy of the Old Stone Age would doubtless be taught to make stone tools and weapons. Chief among these would be the implements of the hunter, which he made and kept in repair himself. He would probably first be shown how to point a stick and harden it by placing it in the fire. Then he might be taught how to make a throwing-stick, or apparatus with which spears are cast, such as have been found at La Madeleine, and are still used by the semi-savage tribes of the North-West coast of America and of Australia. This implement really gives a greater leverage to the arm in casting a weapon, and allows it to be hurled with greater precision. It would, therefore, be exceedingly useful to a scout. It is certain that the making of the finer weapons such as hammers, axes, and scrapers would not be expected of him for some time, as it must have taken many years to acquire dexterity in such work, even of the most primitive kind. There are still in England a few flint-knappers, as they are called, who can make imitations of the delicate arrow-heads so much sought after by collectors, and who frequently pass off these forgeries on the ignorant as real antiquities; and it is known that it has taken these men years to become efficient in this work. But in the Old Stone Age the bow, and therefore the arrow, were unknown, and so our hero would be without one of the chief delights of savage boyhood. In order to gain a clearer picture of the boy of the Old Stone Age, let us follow his life-story in imagination. Let us suppose that he lived in one of the temperate periods between the lee Ages. The family cave in Northern France has grown a little overcrowded, and it is felt that a young man of thirteen should seek his fortune in a less restricted sphere. To the north there is a much more extensive hunting-ground where he will be able to thrive better. Life is such a struggle in the real sense of the word that his parents will scarcely be sorry to see the last of him. His father gives him a stone hammer and knife for which he has no further use, and his mother a skin bag of pounded buffalo flesh and a little necklace of bears' claws, which she hopes rather than feels will keep him secure from the animals of that species. The parting meal of the family is eaten together. A marrowbone is specially cooked and broken to provide the youth with a last delicacy. His father and uncles press advice upon him, and much is said regarding the strange land to the north where game is plentiful. 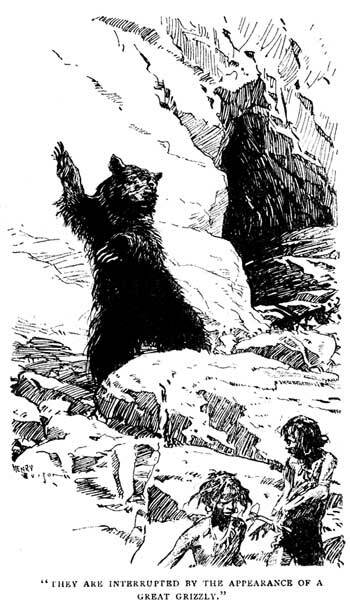 Then, along with another boy adventurer, the young scout takes a farewell of his kindred, and sets cautiously about the task of negotiating the grassy plain that lies between him and the land whither he is bound  where, in some remote future, will roll the waters of the English Channel. There is no "Babes-in-the-Wood" feeling about the pair, for from infancy almost they have been used to fending for themselves. They are in a country teeming with brown bear, grizzly, otter, wolf, fox, roe-deer, urus, bison, boar, horse, and hare, and they are not at all particular which of these they eat. But more than the most fierce of the beast-foes they may encounter they dread the scattered families of hunters through whose lands they must pass. These are not yet tribes, but they often number as many as six or eight grown men, living in caves or skin tents, who would certainly resent the invasion of their hunting-grounds. The lads, therefore, resolve to keep to the higher lands, from which they can see a great deal of what is going on below, and can screen themselves from observation by crouching behind bush and keeping away from the actual skyline. If they can reach the new land unscathed, they will enjoy plenty of space with little fear of intrusion, for only the bolder spirits have, so far, ventured there. Night falls. They have eaten most of their rough provender, but, used to long spells of hunger, they climb a tree and sleep there, keeping watch and watch about. Next morning they resolve to keep on the outskirts of the great forest that covers the middle of the isthmus between the greater and the lesser land, for, by doing so, they will be able to escape quickly to the open from wild beasts and into the thickly wooded recesses from men, should either attack them. As they make their way as quietly as possible over the mossy carpet that fringes the wall of trees, they hear a rustling of branches, and, turning quickly, see what they dread more than grizzly or wolf  a grim and defiant hunter of their own species, whose small eyes gleam viciously from under a thick shock of hair. Too late! He has caught sight of them, and, raising his long, hairy arms, rushes upon the boys with a dreadful snarling. Each of them seeks cover behind a tree, and our hero grasps his father's rude hammer. As the terrible forest man comes on, the boy, his nerves strung to the uttermost, raises his weapon and hurls it with all his strength. It flies straight and crashes between the fierce red eyes. The man of the woods crumples up and lies still, stunned into unconsciousness. Without the loss of a moment the boys are off. That night they find a deserted cave and, coming across the tracks of hare, set snares. Returning to their bleak lodging to prepare for supper, they are interrupted bythe appearance of a great grizzly, who had rented the vacant cave before them, and who returns unexpectedly at sunset. The boys have just time to make themselves scarce, but he has picked up the scent, and hurtles after them at a speed that seems marvellous in so huge a creature. Quick as he is, however, the boys are still speedier, and, when they are certain that they have quite out-distanced him, they once more prefer to spend the night in a tree. So, by slow degrees and painfully, they reach the land of promise. We cannot follow them there, but they find the unoccupied country at the foot of the vast glaciers much more to their taste than the crowded home-land. Here they can live securely enough in a cave which seems never yet to have been inhabited; they procure all the game they require; they manage by experience to keep the wild beasts at bay, and grow rich in skins, in dried meat and in weapons. They come in touch with other adventurers of their own race, exchange ideas about the manufacture of traps and stone tools, and make improvements in these. The god of the new country takes them under his protection, and they flourish. Centuries pass. The neighbourhood in which the boy-hunters once settled has altered out of all recognition. The glaciers have vanished, the stunted fir trees have given place to oak and beech, and the country appears much less wild. It is the Neolithic or New Stone Age. Here and there irregular patches of corn and barley surround a rude village fortified with a high stockade, and on the more distant plains large herds of half-wild horses, about the size of Exmoor ponies, graze or gallop. The village itself is squalid enough, and animals and people seem to share the shelter of the rude thatched houses of wattle and mud. Small cattle, dogs, and poultry are everywhere. The dwellings of the chiefs, which are circular in shape, are built of small stones placed one upon the other without mortar, the doorways facing the east, the place of sunrise. Children abound. But now they are very different from their elders, and, although they are regarded as something of a nuisance, as in many mean streets to-day, there is much more tolerance in the grown-up attitude towards them; they are taught the lessons of the life they must lead, and they even have games of their own. The boys herd together almost as the little wild horses do. They have a game something like hockey, and their play is exceedingly rough. The clubs are made of wood, and the ball of flint or bronze, for metals are now in use to some extent, though they are still very scarce. The lads, too, are each equipped with a stick hardened in the fire, with which they play scouting games or engage in mimic combat. They have toy darts and bows and arrows, which are almost as dangerous as they look, and to lose an eye is quite an ordinary occurrence. They have a game, also, which they play with knuckle-bones  a game which one-day will become draughts or chess. Throwing the great stone, catching and riding the little horses bare-backed, and running, provide the boys of that far-distant time with plenty of amusement for the hours when they are not hunting the wolf or trapping the hare, or catching fish with their bare hands. Still is the greater part of play connected with the getting or keeping of food, just as the games which make the muscle and train the intelligence of the scout of to-day are directed to the keeping, as they were once to the getting, of empire. And so it is, in a measure, with the Neolithic boy, for the man of the New Stone Age has now rot only to guard his settlements against ravenous beasts, but against enemies of his own kind. Man-power is the secret of success in the Neolithic tribe, and chiefs and leaders from time to time watch the games and sports of the greater lads with an anxious eye, seeking to pick out those who will make stout warriors. We know that in later times, in the Age of Bronze, for example, a great warrior might well achieve a name for himself while yet he was a mere boy. Prehistoric boys whose names are great in legend and saga are Cuchullin of Ireland, whose skill at hurley, a kind of shinty, so angered his youthful playmates that they attacked him, with dire results to themselves; and Sigurd, in the Saga of the Volsungs, who did mighty feats of derring-do long before he was out of his teens, and who belonged to the Iron Age. Only a very few skeletons of boys of the Prehistoric Age have been found, although many belonging to grownup people have been recovered; and this would seem to show that the boys of that far-distant and little-known time were, like the boys of to-day, pretty well able to look after themselves, and had a better chance of escaping from enemies, animal or human, than their parents had. Both by instinct and training, they were scouts in a very real sense.